Saint John’s Health Center (SJHC) hosted its 2014 Power of Pink event October 23, at House of Blues in West Hollywood to benefit the Cancer Prevention Program at Saint John’s Health Center. The evening was attended by more than 700 people. P!nk performed an intimate acoustic set with friends including Linda Perry, Nate Ruess, Dallas Green, Butch Walker, Justin Derrico and Billy Mann. Celebrities attending included Melanie Griffith, Valerie Bertinelli, Camila Alves, Katie Holmes, Chris Meloni, Sara Gilbert and Samantha Harris, among others. The Power of Pink is a fundraising event recognizing and celebrating the strength of women who battle and beat breast cancer daily. Proceeds from the event go directly to the Cancer Prevention Program at the Margie Petersen Breast Center at SJHC. SJHC believes that ultimately, prevention of cancer may be the most effective cure. “The power and momentum of this event coupled with the generosity of our donors allows us to offer through our Cancer Prevention Program genetic risk assessment, nutritional counseling, yoga therapy, acupuncture, massage therapy and meditation as integral parts of a patient’s care. We are grateful to our sponsors, and together, are all deeply committed to saving lives through the prevention of cancer. 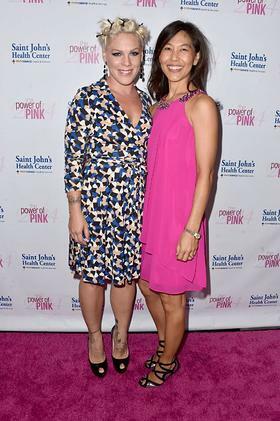 And, we are humbled by our collaboration with P!nk who gives so generously of her time and talent to help support our efforts,” said Dr. Maggie DiNome, Chief of General Surgery at Saint John’s and Acting Director of the Breast Center. Power of Pink is made possible by the support of event sponsors: John Wayne Cancer Foundation, Duke Bourbon, Tervis, Inman Family Wines, LiveNation, House of Blues, Chocolate Sun and Uber. Since its founding in 1942, SJHC has been providing the patients and families of Santa Monica, West Los Angeles and ocean communities with breakthrough medicine and inspired healing. Providing the latest in diagnostic technology and specialty care with a strong dedication to our core services: cardiac care, oncology, orthopedics and women’s health, SJHC is honored to be voted one of America’s Top 50 Hospitals and is devoted to providing leading-edge medicine with unwavering compassion and personalized care. For information, visit providence.org/saintjohns.